» What Is the NFL’s ‘Corner 3’? What Is the NFL’s ‘Corner 3’? The corner 3 has become a signifier of the NBA’s analytics revolution. Because the league average on 3s from the corner and 2-point shots away from the rim is nearly even, the former is now widely understood as the most valuable jump shot in basketball — it’s more than a foot and a half closer than the top of the key, but still worth three points. An effective offense has players who can create and make them, and a good defense is built to stop them. Better shooters and better creators help maximize their value, but across the league, corner 3s produce better outcomes than any field goal attempts that aren’t layups or dunks. Despite being an available option since the 3-point line’s invention, only in the last few years have they become basketball’s gold standard for efficiency. The NFL’s corner 3 should be the play that creates the highest expected value, independent of factors like team construction and game situation. Success in basketball and football isn’t a one-to-one comparison. Possessions in basketball are, for the most part, created equal. If one ends with the ball going in, it’s a successful trip. Football involves a few more factors. Five yards on first-and-10 and five yards on third-and-6 are two very different outcomes. ESPN’s “expected points added” stat takes that into account. You can find a full explanation of how EPA works here, but the gist is this: It measures what impact individual plays have on a team’s chances to score, all while taking into account influences such as down, distance, field position, and time left on the clock. It provides a chance to see what teams can expect from individual plays across situations. The simplest distinction of offensive plays is between runs and passes. If we’ve learned anything in the past decade or so in the NFL, it’s that great passing is what defines great offense. It’s not a surprise, then, that the numbers bear that out. Runs have accounted for about 43 percent of offensive plays in the past five seasons, with an average EPA per play of minus-.04 and a successful play percentage of only 37.9 percent. Only four teams over that stretch have an average EPA above zero: the Eagles, Panthers, Patriots, and Vikings. It’s a fairly predictable list. LeSean McCoy and Adrian Peterson are both involved. New England is also atop the list of best passing teams with .23 EPA per play, tied with New Orleans for the best mark in the past five years. They’re just two of the 20 teams with a positive EPA in that span. The league average is .04, with an SPP of 44.1 percent. The takeaway: Passes are typically more efficient than runs. That doesn’t help us much, though. We want to know what type of pass is most efficient. When my buddy first brought up this idea, my gut response was screen passes, based on nothing but anecdotal evidence from watching a lot of football. It seems like every screen ends with a lot of yards, and I’ve wondered why they aren’t a more central part of offenses. As it turns out, screens don’t have that much more value than passes in general. They yielded .07 EPA per play in our five-year stretch, with an SPP of 42 percent — a sign that there was a bigger discrepancy between teams that used them well and teams that didn’t. Denver tops the list at .29 EPA. Just thinking about what Knowshon Moreno did on middle screens last year makes the Broncos a logical choice, but they’d actually been proficient in the screen game even before Peyton Manning arrived, finishing third in EPA per play from 2009 to 2011. Thanks to the nightmare that is McCoy in space, the Eagles rank second. Tampa Bay has the distinct pleasure of being both the worst screen team in the past five seasons (minus-.22 EPA/play) and also running screens on fewer plays than anyone else. No sense in beating your head against the wall, I guess. What separates screens from other play types is that they’re highly dependent on situation. Screens on third down, when defenses typically have more defensive backs on the field, are about as useful as the average run (minus-.04 EPA). When defenses blitz, though, a screen is actually one of the most efficient plays available. Against five or more rushers, teams averaged .22 EPA on screens, with 27 teams having a positive EPA. That’s consistent with conventional football thinking: When a defense sends more bodies after the quarterback, it vacates the middle of the field. But catching a team in that spot requires knowing when it is sending extra rushers, which isn’t easy. What we’re looking for is a type of play that transcends situation and doesn’t rely on having to find a match for what a defense is doing. Just like screens, play-action passes have always felt like an approach that consistently leads to quality offense. The 2012 Washington offense, for example, used an abnormally high number of play-action throws in its pistol-heavy scheme — and often with excellent results. It turns out my memory’s interpretation of play-action is clearer than screens. Independent of situation, across the entire league, play-action throws had an EPA of .17, with a 47.6 SPP. Only the Jaguars had an average EPA of less than zero1 and, again, the Patriots were at the top, with a per-play average of .38 EPA. The success across situations is relatively similar, with the differences coming about where you might expect. The prevalence goes down as teams get further into a series, with the majority of play-action plays coming on run-heavy first downs and only about 6.7 percent coming on third down. The success is fairly even from first to second down (.17 SPP and .18 SPP) and drops slightly on third down (.11 SPP), when the threat of a run isn’t quite as real. While some offenses do play-action passes better than others, teams can generally expect positive results. The question, then, is Why? Last season, no team used play-action on a higher percentage of its total drop-backs than the Seahawks. Seattle’s offense revolved around a steady, even gluttonous, diet of Marshawn Lynch; making teams pay for overcommitting to him is just good strategy. This play is from Seattle’s Week 1 win against Carolina, a game we all would have been paying more attention to had we known what we did by the end of the season. It’s first-and-10, with Carolina up 7-3 more than midway through the third quarter. The Panthers’ defense is in a nickel formation — their base defense — to match Seattle’s three wide receivers. Linebackers Luke Kuechly and Thomas Davis are manning the middle of the field. The main targets of the play-action fake are linebackers, and every element of this play is designed to make Kuechly and Davis think it’s a run. Even before Russell Wilson fakes the handoff to Lynch, they’ve both taken a step forward, based solely on Seattle’s line blocking like it’s a power run play. 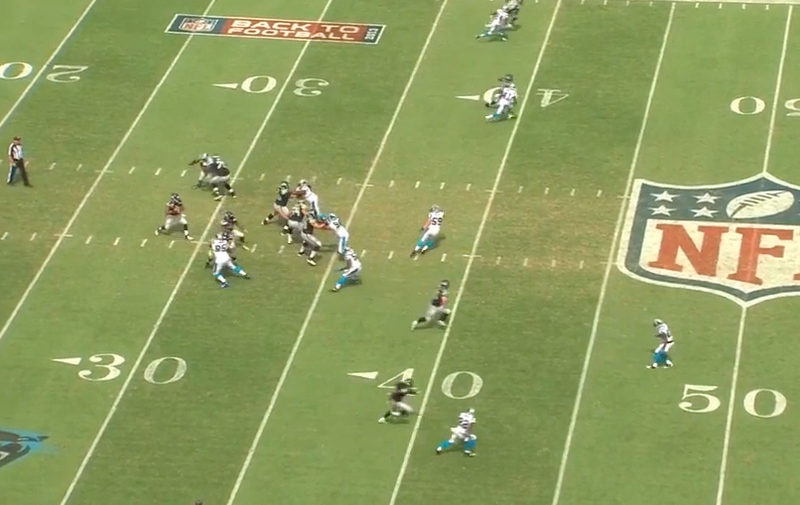 By the time Wilson shows the ball, Kuechly and Davis are two yards closer than where they started. 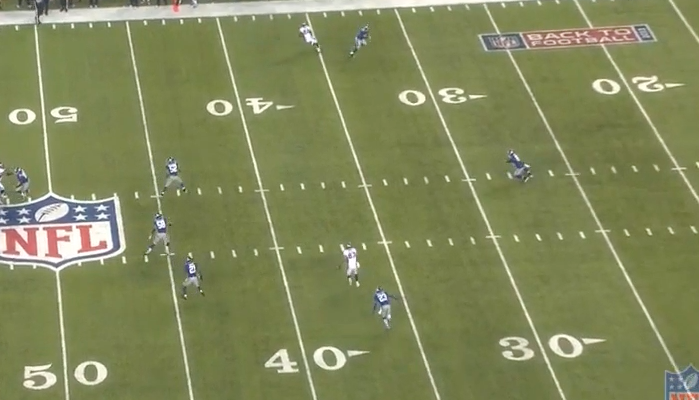 That leaves Zach Miller plenty of space in the middle of the field. Maybe the best pass-defending linebacker in football — Davis — is down in the muck near the line of scrimmage, and Wilson has a fairly easy throw that goes for a first down. Watching how the Panthers react is a good way to understand how play-action translates to different areas of the field. EPA/play is highest between the numbers, right in the spot vacated by charging linebackers. The numbers tend to dip as throws move toward the sideline, where defensive backs are operating without as much worry for what’s going on in the backfield. Seattle is an example of what a bruising running game can sometimes lend to play-action. The Seahawks enjoyed the league’s fourth-highest change in EPA/play last season when comparing play-action plays to other passes. Just as a slashing John Wall creates more opportunities for his teammates to bomb corner 3s, a running back like Lynch can make a run fake more effective. There are several cases in the past five years where play-action success is connected to run-heavy offenses like the Seahawks’. Houston, San Francisco, and Washington all rank in the top five for the largest difference in EPA/play between play-action passes and other throws. But there are plenty of examples that show a great run game doesn’t guarantee better returns. One of the teams that’s run the most play-action passes since 2009 is, unsurprisingly, Minnesota, which faces a defense every week that’s geared up for Peterson. When it comes to their success on those plays, though, the Vikings rank 21st in EPA/play. This is a blow to the notion that establishing the run is the vital factor in play-action. A defense being preoccupied with Peterson doesn’t guarantee a chunk of yards through the air when he’s used as a decoy. In fact, of the four teams that finished with a positive EPA/play in the run game, only one (New England) finished in the top 10 on play-action plays. What is a slight surprise, however, is that none of the teams near the top would be considered running teams. The Packers, who are 18th in rushing attempts since ’09 and had been shuffling backs for years before Eddie Lacy showed up, rank third (.33 EPA). The Broncos are right behind them, at .31 EPA, and most of that damage was done since Manning arrived. That’s because play-action passes are still passes, and the teams with the best quarterbacks still typically get the most out of them. In 2013, Denver led the way with .57 EPA, and San Diego, second in passing DVOA, was no. 2 (at .55 EPA). Supporting the claim that establishing the run doesn’t necessarily mean play-action success are last year’s Bills (minus-.18 EPA). Buffalo led the league in rushing attempts but ranked last in EPA/play on play-action. For a team like the Bills, those numbers tend to have a significant relationship. Head coach Doug Marrone’s tendency to lean on his ground game was a way to protect his group of young quarterbacks, a group that isn’t set up to make the quick reads necessary on play-action throws. A defense’s response to a run fake is based as much on instinct as it is on logic. Play-action throws from the typically pass-happy shotgun produced an EPA/play of .21 last year, making play-action from the shotgun even more effective than it was from all formations.2 With three receivers on the field, teams averaged .21 EPA/play a year ago. Take a receiver off, and that drops to .14. This is just another reminder that even though we typically link good play-action teams with good running games, equipping your quarterback with the best possible options may actually be more important. There are cases, though, when just going through the play-action motions isn’t enough. Two years ago, Washington used play-action on 36.9 percent of its drop-backs. It was the main weapon in easing Robert Griffin’s transition to the league as a passer. With teams scrambling to figure out the zone read — and living in crippling fear of Griffin as a runner — adding a play-action wrinkle was almost unfair. Washington averaged .49 EPA/play while racking up 10.35 yards per play. As Football Outsiders pointed out in its always-useful play-action numbers, Washington’s usage dropped significantly in 2013, but its effectiveness fell even further. Only four teams had a worse EPA/play on play-action passes in 2013: St. Louis, Jacksonville, the New York Jets, and Buffalo. That’s a rough list. It’s a decline that makes sense considering the outside factors. Griffin’s knee limited him as a running threat and stifled him as a passer, playing from behind made run fakes less credible, and defenses were much more comfortable diagnosing zone-read plays. Just as there are exceptions with the corner 3, there are a few teams that just aren’t built to lean on play-action. Despite building a defense formatted to prevent the corner 3, the Bulls ranked 25th in rate of corner 3s taken last year. They simply don’t have the crop of shooters. For play-action passes, that shortcoming usually comes in the form of a bad offensive line. Because play-action throws take longer to develop, they typically lead to more pressure. Since 2009, quarterbacks have been pressured on 27.9 percent of play-action drop-backs, compared with 22.2 percent on all throws. That’s one reason a team like Miami, which ranked 30th in adjusted sack rate, was able to use play-action on only 14 percent of its drop-backs — near the bottom third of the NFL — despite ranking in the top half of the league in EPA/play with play-action. When a quarterback barely has enough time to get quick passes away, including a fake handoff in the process probably isn’t going to help. Expect Miami’s use of play-action and even its proficiency with it to improve this year. The Dolphins have a brand-new offensive line, and although their guards still leave a lot to be desired, Branden Albert and first-round pick Ja’Wuan James should at least keep Ryan Tannehill from spending the year on his back. Add Bill Lazor, the Dolphins’ new offensive coordinator and Chip Kelly’s quarterbacks coach in Philadelphia last year, and there should be a lot more play-action in Miami. Miami’s hiring of Lazor is just another example of Kelly’s influence, and an increase in play-action comes along with that. The Eagles offense used play-action on 30.8 percent of its drop-backs last year, second only to Seattle. Philadelphia does qualify as a run-heavy team that can use play-action as a counterpunch, but it’s probably not a coincidence that the most innovative offensive mind in football relies on the most efficient type of play available. We see the same trends in the NBA. Kelly’s willingness to be radical is similar to the approach Daryl Morey has taken with the Rockets. Houston ranked fifth last year in use of corner 3s3 and also happened to rank fourth in offense efficiency. Among the top five teams in offensive efficiency, three — the Heat, Clippers, and Rockets — also ranked in the top five in attempting corner 3s. Using that shot and being a high-quality offense have become intertwined. Football isn’t quite there — yet. Run-first offenses are still using the most play-action. But as more teams recognize the positive effect of play-action independent of a quality run game, that may change. All it takes is a little nudge. It may seem like the corner 3 has exploded of late, but the shift has actually been gradual. Last season, it accounted for 6.7 percent of all shots, compared with 5.9 percent in 2010. The NFL’s use of play-action has been fairly steady for years, and there are reasons some teams don’t use it more often. It has a limited effect on third down, and it does heighten the chance your quarterback has to deal with a 300-pound lineman bearing down on him. Still, teams should probably keep in mind what even a marginal increase can do for an offense. Hesitance on third down is fine, but leaguewide, more play-action on second down seems like an easy choice. There’s no good argument for 57.6 percent more play-action on first down than second. Football Outsiders’ numbers show that the Cowboys are one of the main culprits there. They ranked 31st in second-down play-action rate last year — a number that makes absolutely no sense considering their excellent running game and that they’ve ranked sixth in EPA per play-action pass since 2009. The Cowboys might be the worst offenders, but they’re just one example. There are still too many play-action options left on the table. How defenses would react to more play-action is another issue. For years, the main concern of NBA defenses was cutting off paths to the paint; with the increase in corner 3s, defenses have started planning how to run shooters off the line, sometimes at the expense of a drive to the rim. Ask any NFL defensive coordinator about his first priority, and he’s likely to say “stopping the run.” If we were to see teams rely more on play-action, those priorities would have to change. Making an offense prove it can hurt you by running the ball would be a safer option than being gashed by play-action. In any case, it’s inevitable that defenses would ultimately adjust. They always do. Their recent late-season failures have clouded the greatness of the Patriots’ offensive dominance. New England’s offense has been in the top five for EPA/play every season since 2009. They’re tied for first, with New Orleans, in the passing game and are tied with the Vikings for third on running plays. The superiority of Tom Brady’s offense shows up everywhere. No team has been better at converting first downs. No team has been better in the red zone. And, predictably, no team has been better using play-action. At .38, New England is .05 EPA/play ahead of runners-up Green Bay and Pittsburgh. It follows that the league’s top offense would also be its best play-action offense, but in some ways, that makes Brady the NFL’s equivalent of Ray Allen. The best shooter in basketball will also likely be one of its best corner shooters, but by building his game around the most efficient shot available, the Heat spent the past two seasons wringing out every drop of his value. Any Patriots play from the past five seasons had a good chance of ending well, but play-action still yielded them about .15 more EPA/play on passing plays — the 12th-best total in the league. That increase is similar to what most of the teams in the league have seen, and like every other team, the Patriots probably should have relied on play-action even more than they did. Mining hidden value from sports often requires pressing against the game’s framework to the point of discomfort. The NBA’s push for more 3s has meant players and coaches stepping outside long-held beliefs. But finally the game is catching up to the math. There may be a similar opportunity waiting in the NFL. The question is whether anyone will take it. And even their minus-.03 EPA on play-action passes is an improvement on the minus-.07 they averaged overall. For reference, passes from the shotgun produced nearly the same .04 EPA/play as passes from all formations. As a percentage of field goal attempts.